Most asteroids are found in the region between Mars and Jupiter, and the vast majority lie closer to the Sun than the location, about 3.3 AUs from the Sun, where the orbital period would be in a 1 to 2 ratio with Jupiter's orbital period. 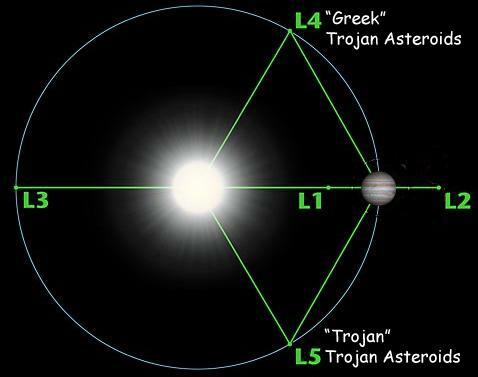 There are, however, two fairly large groups of asteroids which orbit the Sun exactly in the orbit of Jupiter, at the L4 and L5 Lagrange points, 60 degrees ahead of and behind Jupiter. At these points, the gravitational influence of the Sun and Jupiter combine to keep the objects more or less locked in place, alternately drifting very slowly toward smaller or larger orbits, but on the average, retaining exactly the same orbital size and period as Jupiter. The asteroids in these groups are referred to as the Trojan asteroids, as they are named after characters in mythological histories of the penultimate battle between Greek and Trojan societies, supposedly started when Paris, a Phrygian prince and shepherd of exceptional honesty, was asked to judge which of three goddesses, Hera, Athena and Aphrodite, was the most beautiful. Each goddess attempted to bribe the judge, Aphrodite being successful in her effort by offering him the love of the most beautiful woman in the world, Helen of Sparta, subsequently called Helen of Troy. Since Helen was already the wife of the Spartan king Menelaeus, Paris' acceptance of Aphrodite's bribe incurred the enmity of the Greeks, and of course the spurned goddesses were none too pleased, and as a result, after a twenty-year siege Troy was leveled, and its inhabitants killed, enslaved or scattered to the winds.